I'm skipping writing a blog post tonight. For numerous reasons: I'm exhausted, there are some things going on I can't talk about, I'm feeling a bit negative/worried tonight and don't want to put that out there, but first and foremost...I'm just not feeling it. I have a few ideas swirling in my head, but I can't quite get a solid grasp on any of them enough to make it into a whole post. (by the by, that's such a frustrating feeling) However, after yesterday's reflection on routines, I am forcing myself to type something...in essence, to make something out of nothing. Why? Because if I at least type something I'm keeping that routine...even if I don't really have anything to really say. 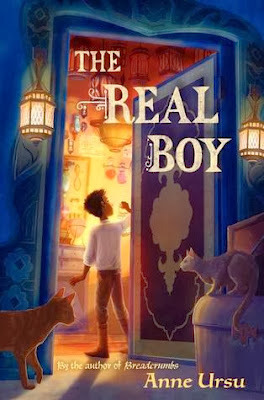 THE REAL BOY by Anne Ursu released today. It's a book I loved and I hope you will too. I feel exactly the same way! I have something drafted, but the end isn't coming together, so I'm reading other people's posts instead! Hope your worries get resolved for the best.